Country music's finest will be honored during the live broadcast of the 37th annual Country Music Association Awards Wednesday night in Nashville. For the 12th consecutive year, 18-time CMA award winner Vince Gill resumes his duties as one of the funniest award show hosts ever. It is a job, he says, he does not lobby for. "It's a scary job." Gill tells The Early Show co-anchor Hannah Storm, "This is a really big deal for country music to finally get the opportunity to be in primetime television on CBS, a major network, so we really want to put our best foot forward every year." Last year, he made quite an entrance riding on a tricycle. Gill says, "You know, it's funny. It was on a big motorcycle and a lot of stuff blowing up in the opener. So I came out on a tricycle with sparklers. I thought that would be funny." Asked what fans should expect this year, Gill says, "Alan Jackson and Jimmy Buffett are opening, so I might come out with a couple of margaritas." As at many previous awards ceremonies, Gill will perform as well as host. What is different this time is that his 21 year-old-daughter, Jenny, is joining him on stage to perform "Young Man's Town." Proudly, Gill notes, "She does a great job." "Young Man's Town" conveys the inevitable transition between different generations and gently advises those who lead today to "teach them what you know and pass it on down." A highlight of the ceremony is a special tribute to Johnny Cash and his wife June. Willie Nelson, Kris Kristofferson, Sheryl Crowe, Travis Tritt and Hank Williams Jr. will perform on behalf of the country music family honoring the Man in Black. Gill says, "It will be spectacular. I think he may be the most influential guy of all music. I think even more than Elvis. I think he had the respect of every genre of music. He's really going to be missed." The 37th Annual CMA Awards will be broadcast live from Nashville's Grand Ole Opry House on Wednesday, Nov. 5, 8 p.m.-11 p.m. ET. The CMA Awards became the first music awards show to be broadcast on network television in 1968. 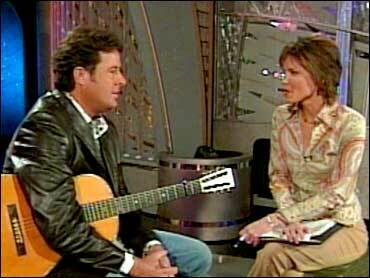 Gill performed his single, "This Old Guitar And Me" on The Early Show. Vince Gill has received a record 18 CMA Awards since his first in 1990 for Single of the Year, "When I Call Your Name." He's been named CMA Entertainer of the Year twice. He's won the CMA's Song Of The Year award four times. He's won 15 Grammy Awards. His new CD is called "Next Big Thing." Gill produced it himself. Several guest vocalists appear on his new CD including: his wife, Amy Grant; Emmylou Harris; LeeAnn Womack; and Michael McDonald. His 21-year-old daughter Jenny also sings harmony vocals on the CD single "Whipporwill River." He married fellow superstar Amy Grant on March 10, 2000. Their daughter Corrina Grant Gill was born a year later on March 12.